Inglis and NextFab join forces to host an Accessibility Hackathon as part of Philly Tech Week on April 28th! One of Philly Tech Week's themes this year is access, a popular, every-day consideration here at Inglis. Adapted Technology Therapist Charles Sammartino, pictured above, created a LipSync adapted device during a Buildathon last year that is now used by Inglis residents in the Adapted Technology Lab. The prototype device allows residents greater accessibility when navigating their computer screen. Click here to read resident Will Parker's story about how the LipSync device has helped him gain greater control and independence. 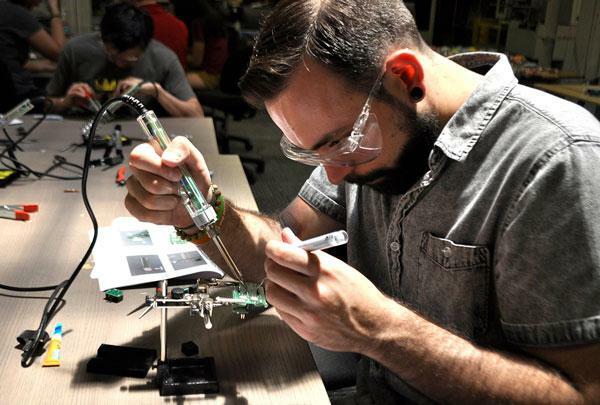 The Accessibility Hackathon collaboration with NextFab brings together Occupational Therapists, Adapted Tech Professionals and Technology Experts to find creative solutions to real-world challenges experienced by Inglis residents with physical disabilities. The 10-hour marathon event is open to the public, ages 18 and older, and will be held on Saturday, April 28 from 11AM-10PM at NextFab's South Philadelphia location, 2025 Washington Avenue, Philadelphia. Click here to register or learn more about the Accessibility Hackathon!